1966. Year of the Fire Horse, a year said by the Chinese to be very unique, full of interesting, even disruptive events. For me it was very much a unique and strange year. I met the Grateful Dead that year and became their soundman. Of all the interesting and wonderful things that I have had an opportunity to do in my life so far, it ranks at the very top of the list. The Dead were young and raw, full of a special kind of energy. They had been a band for only about 6 months and most of their repertoire was covers - but what an eclectic and odd bunch of covers they were. I don't think there has ever been anything quite like them, before or since. At the time I volunteered to be soundman there was no such thing as a dedicated music PA. Musicians either plugged their mic into their guitar amp, or used whatever was at the venue, usually nothing, but sometimes a church or stadium or small theatre might furnish the venue, and there was something. Most bands did not have soundmen anyway. I decided that we had to build a real system to furnish good sound. I asked a friend, Tim Scully, who was heavy into electronics to come aboard and help us. He designed a central preamp and distribution system for all the instruments as well as the vocal channel, and we used McIntosh Hi Fi amps to power Voice of the Theatre speakers. At first the actual vocal system was my home Hi Fi, which happened to be Voice of the Theatre. At the time there were only really three kinds of PA systems all primarily used for voice rather than music - there were small systems in churches, and in movie theatres, lastly in large baseball and basketball stadiums. Needless to say, they did not have either the power handling capability or the frequency range needed. The PA became a long-term project which would lead, over the years, to such innovations as the Wall of Sound, and the founding of Meyer Sound Laboratories. The instrument struggles would lead to the creations of Alembic Guitars. At the time, however, the band were playing their instruments through this weird unitized system which was very horn heavy - each speaker setup had a bass cabinet and a small HF horn. The sound was thick and 'horny', which was (and is) like nothing else. Garcia at that time preferred a hollow body Gibson electric and, coupled with the speakers, it has a sound I have never heard any other guitars make. All this is very apparent on the tracks on this CD. For a while we had a bass augmentation speaker, called a 'Superbass', which we hooked up to Phil. It had an 18" dual voice coil Electrovoice speaker on the bottom pointing down and had passive moving sides made of stiffened styrofoam. We all felt this gadget made a huge effect putting out ultralow frequencies, but it may just have been our imagination - no one saved the box for us to measure later on when we got to the stage we were doing that sort of thing. We may have literally used it up, wore it out; it was intended for the living room Hi Fi. In the beginning we were hanging on to what seemed like a rocket sled, everything needed work and no one knew much about what to do. But we were determined to bring R&R music technology into the modern age. From the very beginning I felt I needed to keep a record of what I was doing as I mixed the PA. I used a stereo reel to reel recorder with the (mono) PA signal in the left channel, principally vocals and drums and a few instruments, with the instruments which were not in the PA - that is, most of them - in the right. The PA was flat-out just managing the drums and vocals in those early days. This resembled the Beatles' first 'stereo' record, and had a lot of 'space' or 3-D effect. I later had to put the vocals into both channels because, as the band started to listen more and more to my tapes, they wanted it to sound more 'conventional'. But panning the vocals destroys most of the space, unfortunately. Floor or ear monitors were still in the future, so the band had trouble keeping the vocals tight and together, and like most young bands, had a distinct habit of rushing the beat, both of which are evident on the tracks. But in my opinion the sound they made in those early days was very special and I am glad my oldest sonic journals have survived this long, so people who have come along recently can hear the sound which captivated my heart and soul close to forty years ago. While poking around the Grateful Dead's vault in the summer of 2002 with Bear, he pointed to a large, brown, nondescript box amongst his other non-Grateful Dead tapes. Bear simply said, "you ought to check that box out." After he split for Australia, I opened the box to find about 15 reel-to-reel tapes, most of which were unlabelled, while some had the most rudimentary identifications, such as "3/2 LA rehearsal," "Trips '66 3rd night" or "February 23 practice." Playing those six or seven tapes that were at least crudely-labeled revealed some true treasures, many of which appear on the CD you are currently holding. However, further major discoveries came on those tapes that were entirely unlabelled. What looked like blank tape based on their markings (or lack of), these eight reels of 1/4" analog tape turned out to be, well, rare cuts and oddities. Imagine my surprise at hearing Jerry sing lead on "Promised Land," Bobby's first known attempt at "Walking The Dog," the first known versions, by far in some cases, of "Not Fade Away," "Big Railroad Blues" and "Good Lovin'," the first known Pigpen 2-song medley of "King Bee" into "Caution"(! ), and the alternate chorus to "Cream Puff War" (a personal favorite in this collection). Plus loads of other great material, including some very rare Pigpen-sung tunes such as "You See A Broken Heart," "Sick and Tired," "Don't Mess Up A Good Thing" and the heretofore unheard Pigpen/Garcia rendition of the Rolling Stones' "Empty Heart" from their second album (which also featured future Grateful Dead standards "Around and Around" and "It's All Over Now"). 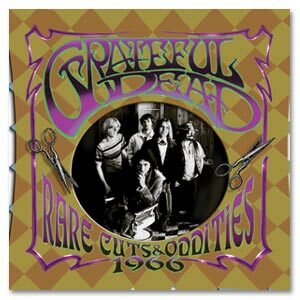 We've also included some rare songs the Grateful Dead only performed a few times including Dorsey Burnette's "Hey Little One" (check out more on this under-appreciated songwriter at www.burnette-rock.com/DorseyBurnette.htm), the traditional ballad (and inspiration for "Dupree's Diamond Blues") "Betty and Dupree," and a polished studio version of "Silver Threads and Golden Needles." This album was released in Spring 2005.